Food tips using vinegar to make your time in the kitchen happier! Since you are looking for food tips, possibly you have school-age children. Are you thinking about homeschooling and you'd like wisdom from experienced homeschooling parents? This site homeschoolingABCs.com is a must--you can avoid trial and error and have homeschooling success right away. Also learn how to save and stretch your food dollars with Grocery Shopping On a Budget. Then come back here for vinegar tips! Vinegar isn't said to be versatile just because both words start with a "v!" Webster's definition of versatile is, adaptable to many uses or functions. And that's vinegar! Not only is vinegar non-toxic, environmentally friendly, budget friendly, and all natural. It gives you tasty meals. And it can also come to your rescue in the kitchen. Things don't always go exactly right as you're cooking or baking. The meat's tough . . . vegetables wilt . . . you added too much salt--or too much sugar. . . you're out of eggs. . . you forgot to pick up buttermilk. . . you're afraid the rice will get sticky again . . . you burned the pot roast . . .
Don't despair. Vinegar may have an answer for you! Vinegar can also be used anywhere in your home for safe, natural cleaning. It kills bacteria and it's amazing at cutting through soap residue. Please visit back-to-basics-cleaning.com to learn more about green cleaning with vinegar! Keep reading for food tips using vinegar. You can add a small amount of white vinegar to the water when cooking vegetables (such as cabbage) to remove the odor. This works with fish, too. Don't worry, you will not taste the vinegar. Or, you can add 1/4 cup of white distilled vinegar to a cup of water. Boil them in a separate pot the same time you are cooking foods that tend to have an unpleasant smell when they cook. The vinegar will absorb the odor. And another idea that's even easier. You can simply place a small container of white vinegar next to your stove while cooking. Again, the foul odor will be absorbed. If you didn't follow any of the above tips while cooking . . . and now there's that foul odor. . . Or, if you burned the pot roast . . .there is still hope! Put vinegar on a dish towel and wave it around the room. (You probably don't want anyone to see you doing this!) The odor will disappear. And if you don't tell, others will never know you burned the roast! You can remove food odors (onions, garlic) from your hands by washing them with white vinegar. If the same foods have left an odor on your cutting board, make a baking soda and vinegar mixture. Sprinkle the soda and then add undiluted vinegar. They will bubble and foam. After 8 to 10 minutes, wash. The odor will be gone! 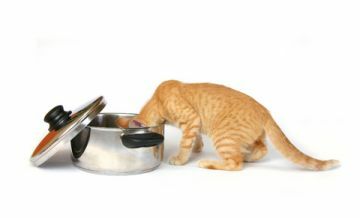 You may have containers (pots & pans, plastic containers, glass jars) that have stubborn odors. Fill them with warm water and two tablespoons of white vinegar. Let stand for several hours. Rinse. Then wash with dish detergent. The odors should be gone. FUN, TEMPTING, AND FREE! Enjoy a fun fact and a new recipe every month by subscribing to my e-mail newsletter, Fun Facts and Tempting Recipes. It's short, too--perfect for people in a hurry!